After you receive a heart scan, you are given a Calcium Score, which is a numeric representation of the total amount of plaque buildup in your coronary arteries. The number typically ranges from 0 to 1,000, but can be even higher. The higher your number, the more plaque you have in your arteries and the greater your risk. If your score is more than 400, for example, you have an increased likelihood of developing symptomatic heart disease – angina, heart attack, or even sudden death – in the next 2 to 5 years. If your score is more than 1,000, you have a 25 percent chance of having a heart attack within a year, if there is not some form of medical intervention. 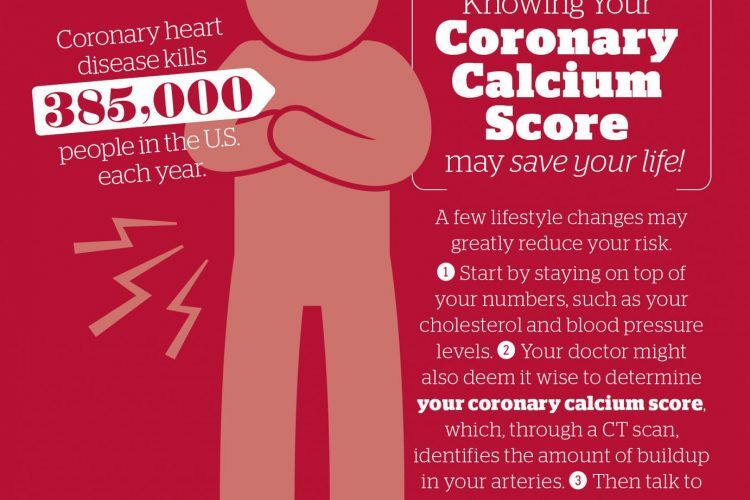 There is no absolute way to predict who is going to have a heart attack, but your Calcium Score is an excellent way of predicting the likelihood of it happening to you. Of course, you must also consider other variables beyond your Calcium Score, when predicting the likelihood of a heart attack. For example, if you smoke, a low Calcium Score will not protect you. Smokers tend to have very sticky blood. This can result in a much larger blood clot developing after a plaque rupture than would develop in a non smoker. On the other hand, someone with a moderately high Calcium Score can forestall a heart attack indefinitely, or even prevent one entirely simply by controlling risk factors. And even if your Calcium Score indicates a high likelihood for a heart attack in the near future, if you begin an aggressive prevention program immediately, your level of risk can sharply decline within months. This may include diet and exercise measures, quit smoking, and not drinking alcohol in excess. Also remember that Cardio Renew is very effective at clearing arterial build ups containing calcium deposits and other harmful mineral deposits and toxic heavy metals, which can help reduce your risk of a heart attack.